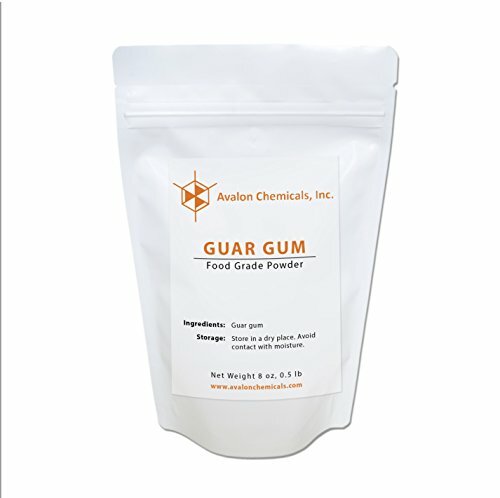 100% Pure All Natural Guar gum powder is a thickening agent derived from guar beans that has enjoyed much use in various baking applications. It is primarily used in hypoallergenic recipes that use different types of whole grain flours. 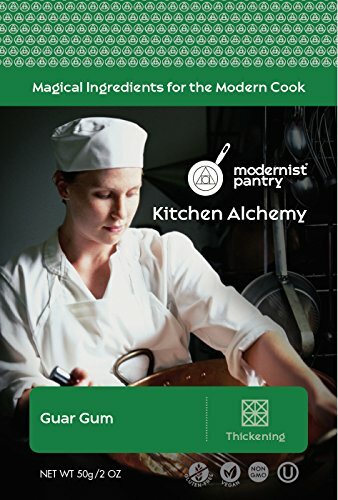 Because the consistency of these flours allows the escape of gas released by leavening, guar gum is needed to improve the thickness of these flours, allowing them to rise as normal flour would. It is especially useful as a binder in gluten-free baking. 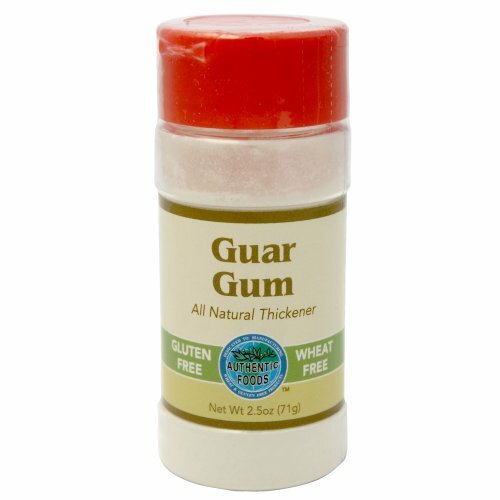 We use this Guar Gum in all our Fresh baked bread products here at Gluten Free You and Me Guar Gum is also an excellent all-purpose thickener for salad dressings, ice creams, puddings, gravies, sauces, cocktail sauce, soups and more Directions: Like xanthan gum, measure carefully when using guar gum in gluten-free recipes or you may end up with heavy, stringy baked goods. Bread and pizza dough recipes: Add 2 teaspoons guar gum per cup of gluten-free flour. 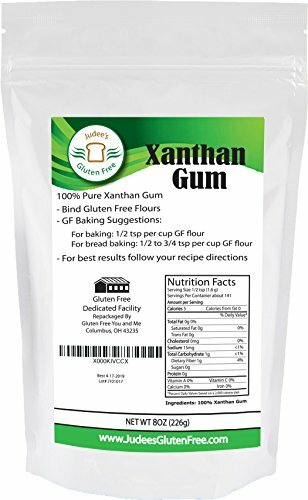 Cake, muffin,quick bread,cookie, and bar recipes: Add 1 teaspoon guar gum per one cup of gluten-free flour Suggestion: Multiply the amount of xanthan gum in a recipe by 2 if you plan to use guar gum as a substitute for Xanthan Gum. 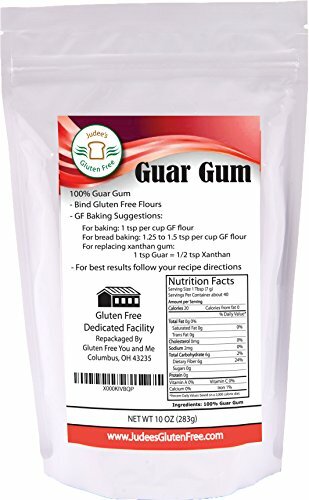 OUR GUAR GUM: HIGHEST QUALITY GUAR GUM: No Added Preservatives Or Artificial Ingredients 100% GLUTEN FREE: A Great Substitute For Gluten & Grain-Filled Flours & Thickeners. ALL-NATURAL ENHANCES TEXTURE, FLAVOR & APPEARANCE OF GLUTEN FREE FOODS FREE OF SUGAR, SALT, YEAST, WHEAT, GLUTEN, CORN, SOY, MILK, EGG, OR PRESERVATIVES. ALL-PURPOSE THICKENER FOR GRAVIES, SAUCES, SOUPS AND MORE NON-GMO VEGAN PALEO CONVENIENT EARTH CONSCIOUS RESEALABLE BAG TO ENSURE FRESHNESS! SUGGESTED USE: For Baking: 1 teaspoon per cup Gluten Free flour For Bread Baking: 1 1/4 to 1 1/2 teaspoon per cup Gluten Free flour. 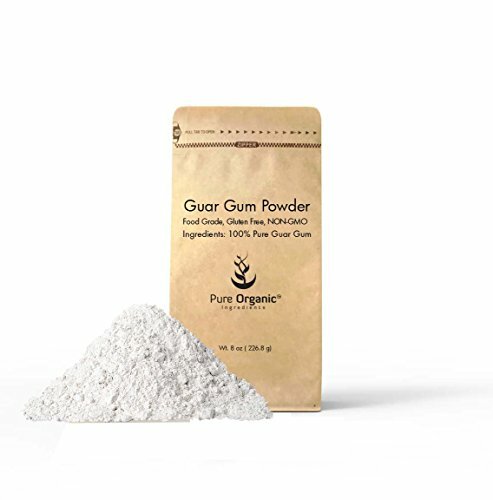 For replacing Xanthan Gum: 1 teaspoon Guar Gum= 1/2 teaspoon Xanthan Gum EARTH CONSCIOUS PACKAGING: At Pure Organic Ingredients we strive to be a proactive, integral, and responsible member of our environment and community. We try to make all our packaging from natural materials like recycled, virgin or dye-free paper. Our Natural Kraft Paper Bags are an Earth-Conscious alternative that present a lesser burden on the environment than our competitor's plastic bags. 100% MONEY BACK GUARANTEE: We are confident that you'll love our products and stand behind every item with a 100% satisfaction guarantee. If you are not satisfied with your purchase return the product for a full refund. 100% USA made!!! 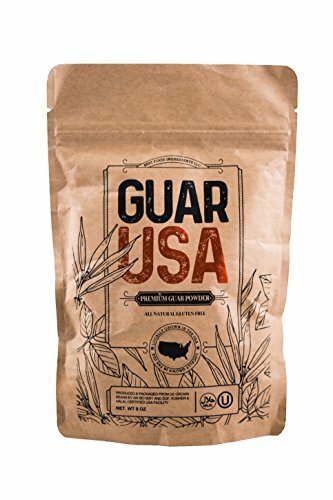 Natural, Gluten Free & Vegan Food Grade Guar Gum Powder, made from USA grown Guar Beans, Kosher & Halal certified. Perfect for baking, cooking & Ice cream making. 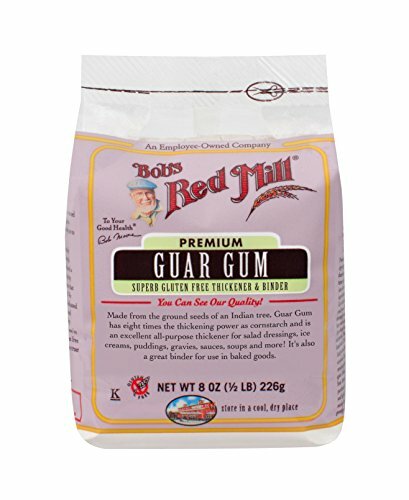 Bob's Red Mill Guar Gum is a unique, vegan gluten free thickener. It made from the seeds of the guar legume, which have been ground into a fine powder. It is used as a thickener in gluten free baking and cooking. Like all of our gluten free-labeled products, this product is processed in a dedicated gluten free facility and R5-ELISA tested to confirm its gluten free status. Now foods guar gum powder is a thickening agent derived from guar beans that has enjoyed much use in various baking applications. It is primarily used in hypoallergenic recipes that use different types of whole grain flours. Because the consistency of these flours allows the escape of gas released by leavening, guar gum is needed to improve the thickness of these flours, allowing them to rise as normal flour would. It is especially useful as a binder in gluten-free baking. 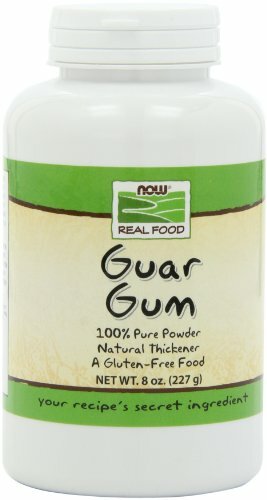 Looking for more Guar Gum similar ideas? Try to explore these searches: Drug Rug, Reconditioned Power Tools, and Sheath Womens Overcoat.